When Thomas found out that our hotel had canoes that guests could use, he suggested that we find a nearby lake to bring them to at sunrise. We all couldn’t resist the idea of seeing the morning light slowly cast over the autumnal colored trees, so we all forfeited our desire to sleep in. And we were so glad we did because it was absolutely gorgeous! We might have woken up a *bit* too early, ehm 5am call time, since there was a mountain on the east side covering the sun until about 45 minutes after sunrise. We found Blueberry Lake only 5 minutes from where we were staying, and by the looks of it online, it seemed perfect. Just big enough to get out on the water and surrounded 360 degrees by gorgeous fall foliage. We strapped the canoe to the top of our rental car and headed out in the dark, early misty morning. Rose and I bundled up in the car while the guys figured out how to get the canoe off, which wasn’t as easy as it looked (ha!). And once we could see a shimmer of the morning light, we joined them down by the water, only wishing we had brought an extra layer. I knew it was going to be brisk out, but I definitely underestimated it. I recently bought one of these featherweight cashmere sweaters and ended up getting a few more colors. It’s the softest fabric and a perfect thickness for layering. I’m wearing the ‘pine forest’ shade but I also have ‘deep ember’ and ‘black’. I layered up over the top with this Penfield cozy fleece zip up jacket that also comes in a vest version with my J.crew vest underneath. It’s my go-to for early mornings and daytime adventures. After the sun way high in the sky, and our fingers were too cold for any more canoeing, we piled back in the car and headed back to the hotel to defrost with some hot tea and pancakes. We were hitting the road again, heading to our next destination in New Hampshire, so we had to fuel up for the long day ahead. Simply an amazing place! Awesome pics! Such a fabulous photos!!! Blueberry Lake is so peaceful and heavenly place! Looks as though this was an absolutely wonderful experience! What a stunning view! Looks like you had a fun time canoeing! Need a little getaway in nature as well to unwind! Beautiful pictures and fall foliage! Such relaxing and enjoyable moment! The landscape is so beautiful! looks like such a fun trip!!! the pictures are so beautiful!!! these pics are so lovely! love the cool scarf! Even though it looks unbelievably cold, this would have been such a perfect & beautiful way to start the morning off. Your layers do look so warm & cozy, I love the mix of Fall colours! Beautiful photos, love all the fall colors! 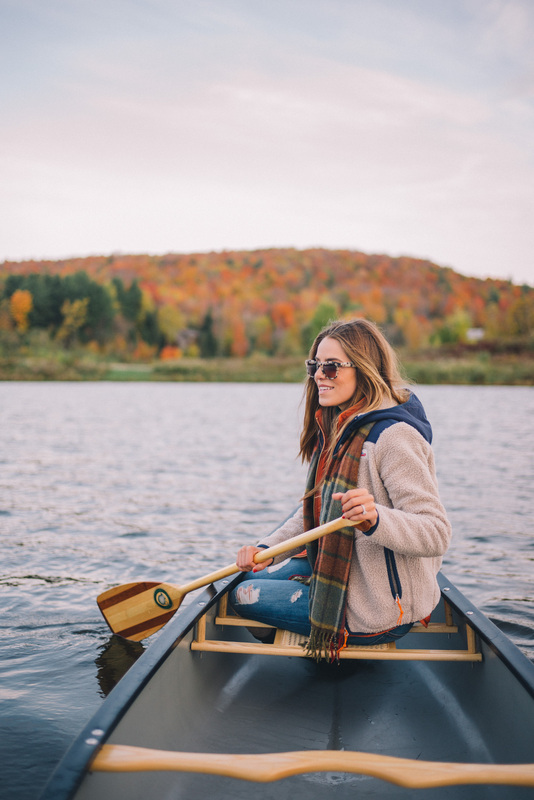 Canoeing is so beautiful, but YES can be difficult to start + sometimes very chilly. I’m almost always wishing I would have bundled up more when I go out at sunrise. I love the options you both chose – especially Rose’s boots! Love this! Looks like a fun and relaxing time. How fun is this!? Such dreamy fall foliage photos!! You guys look so cozy! I love all the layering! Wow! Those are really great photos! That’s an early start but totally worth it, that sunrise looks amazing! Love your hunters too! Cute outdoors look. Loving this look for fall adventures! Especially all of the deep orange hues! These photos are stunning! The fall colors are beautiful. This place looks so peaceful! Love all your layers here too. It’s always worth getting up a little early to catch the sunrise, especially in such a beautiful place. These shots are gorgeous! Oh my goodness! That canoe is too cute! This looks magical! I’ve never even been in a canoe but it looks like a lot of fun. I have to try that at some point. Love your scarf! Hey Julia! Do you own the packable Hunter boots? If not, how to manage to get your original pair in a suitcase? I own some and would love to bring them on all of my vacations they are so versatile, but I just can’t seem to justify giving up the luggage space. I’m thinking about investing in the packable version. Another gorgeous Fall post. The trees look so beautiful over the lake. Great call for Thomas to make sure y’all got up early! Waking up early definitely paid of! What a breath-taking landscape! I adore this outfit! I love the layering and how perfect it would be for a nice canoe trip in the cold. I have a similar vest, but haven’t really taken it out much as I can’t seem to find anything to pair it with. I will definitely look into wearing it more after this gorgeous look! This is honestly so cute. Your outfit is AMAZING (I’m such a huge J. Crew fan), and the backdrop is just perfect. I only wish I could have pancakes waiting for me after a cold morning on the water! Sounds like a glorious morning! Can’t even tell how cold you girls were. The colors are just stunning! Gorgeous photos! I seriously love your casual athletic style. You’re the queen of layering! I love the fall colors and beautiful landscape. The plaid print scarf completes your outfit. Love the sweater weather! Love all the fall colors and foliage! I also love how you layered and I need a vest for this fall/winter! Great pictures! What a fun idea! Those colors are amazing!! Vermont looks beautiful! The photos and fall colors are incredible! I also absolutely adore your outfit! So practical and cute! I think I’ll have to purchase the Penfield Jacket for myself! What gorgeous photos! Looks like y’all had a great time! We have that same VW bus. LOL. We keep wanting to drive it up to Vermont to see my parents (who live up there) and my undergrad alma mater! You’re the cutest! Love your fall outdoors attire! Love this post – fall colours are just so beautiful! These pictures are just all so perfectly fall! Beautiful experience and pretty outfit to go along with it! The fall’s colors are stunning too! De verdad que lugar tan bello, y el look es genial. I absolutely love your images! You always find the best places to take pictures. How do you go about finding locations? I would love to know how you search for them! Canoeing is so much fun, and calming. Can’t wait for the next post!! These pictures are gorgeous-I can’t believe I’ve never been to Vermont during this time of year!! Oh Julia these photos are AMAZING!!!!!! I have trouble finding the perfect layering pieces. You’ve done an amazing job styling this outfit! I can only imagine how cold it was even with the multiple layers! Totally command you for waking up so early into a cold misty morning to go canoeing, it certainly takes real determination – but I can see how it must have been totally worth it! These photos are breathtaking! We did a Fall New England trip a few years ago and I love seeing what other people experience. Looks like a great day! This looks so so fun!! Looks like such a fun trip! Can’t get over the gorgeous colors! Love this look and those Hunter boots! I literally went WOWWWWWWWWWW when I saw that scenery. Such gorgeous photos! It’s amazing how beautiful the leaves look in the fall! Love the outfit too! Your outfits always inspire me! Love this post! It makes me want to hop in and join you all haha! Wow the scenery is just breathtaking! <3 :) Hahaha 5AM is a tad early, but for this, I'd definitely say yes! I love how beautiful the sunrise looks! I love these autumnal posts!!! You guys do such quality work! My husband is from Vermont and we just moved to Alaska, so it’s been such a treat to see some images from home all the way out here! Wow! The colours, the vest the ORANGE! So beautiful! Perfect outfit for a morning canoe! Hi Julia! Do you mind sharing what size you are in the Penfield jacket? I’m looking to get one too! Love how you styled this! upon your weblog and in accession capital to assert that I acquire in fact loved account your blog posts.